Hi all! I am popping in today to share with you my entry for the latest Lawnscaping Challenge. The challenge is all about focusing on sentiments. I had fun creating this card as I really thought outside the box on this card. It was a little time consuming- but totally worth it seeing the end result. I started off my die cutting using the Hello Scripty die from Lawn Fawn several times out of some Inkadinkado Stamp Masking paper - and I applied each one in a different orientation as if I stamped in onto my card stock. I used a piece of Tim Holtz Water color card stock as I knew I would be using a lot of Distress Inks and adding a bit of water. And, the DI blend easily on this card stock in my opinion. So once I had all of my die cuts adhered, I took a piece of scrap card stock and ripped the edge to create a fun "mask" to define each color as I applied it. In the end, the torn edge is a bit lost because I did use a little water to create some water droplets on my panel, but that is totally OK. The Distress Inks I used are Fossilized Amber, Dried Marigold, Barn Door, Aged Mahogany, Hickory Smoke and Ground Espresso. I loved how these colors came together - such a fall inspired color scheme!! Once I was done with my inking, I removed all of my "hello masks" to reveal that sharp white detail of each hello sentiment. To add a bit of something to this main piece I ran my card stock through my die cut machine using the Large Stitched Rectangle die to give it a stitched detail. I then worked on the rest of my sentiment by using Owen's ABC's from Lawn Fawn stamping out the word "Friend" and then die cutting each one with the circle dies that coordinate. I added my main panel to a piece of SSS Slate card stock that was cut down to a A2 size card base. 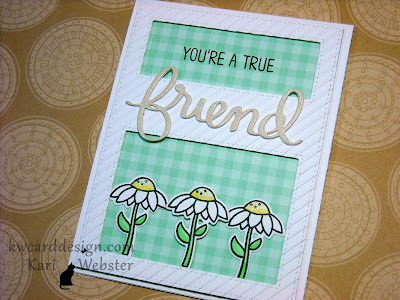 For a finishing touch I added some Wink of Stella clear brush marker to the "Friend" portion of the sentiment. 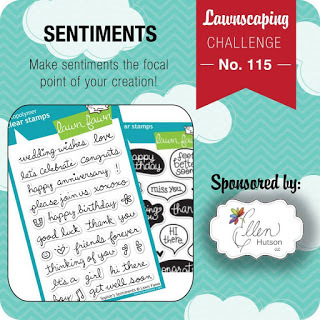 It was fun to create and participate again since my Facebook Inspiration Team ended with Lawnscaping. Felt like old times when I was a regular participant :) Thanks for stopping by!! See you soon! WCMD 2015 - Card Share! 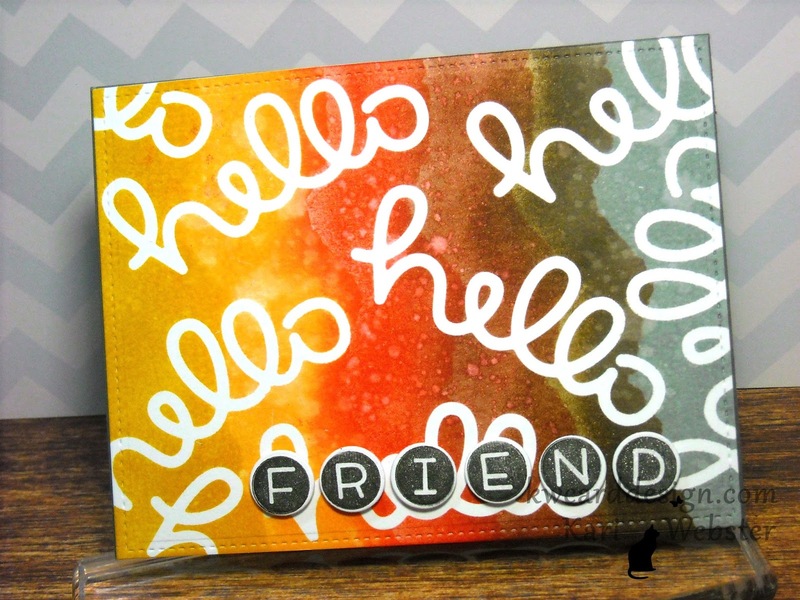 I made this card using various supplies from various of my favorite stamp companies! This card is serving many purposes - obviously for today's special day, but also I will share this on the Simon Says Stamp Blog for the celebration of WCMD. I also wanted to send this card out to a special friend!! I am obsessed with THIS Cover Up die from MFT! It is so fun and versatile! I wanted to add a big of texture to my frame, so I embossed it with a diagonal stripes embossing folder. I also used THIS stamp set from Mama Elephant. It is one of my favorite stamp sets ever!! I also used the Friend Die that coordinates with the stamp set. The pattern paper I used is also from MFT! Love this mint color! My fav!! And, those adorable sunflowers..well they came from Gleeful Gardens from Lawn Fawn. A lot of my favorite products were used making this card - but that's what its about - using your favorite products making cards you love! Hope you've had a fantastic and fun day!! Hi all!! 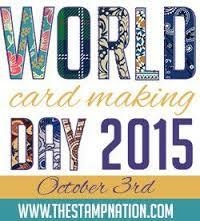 I wanted to wish all my card making friends today Happy World CardMaking Day! This is a special day for card makers! We all love this hobby for one reason or another, and I am sure that we share a lot of the same reasons! It is a hobby that brings out your creativity! It is a hobby that allows us to escape our everyday stresses! I am happy and so blessed to have found this hobby - more or less it found me. I can't believe its been 6 years already that I've been crafting, and creating cards - but I have loved and learned every day since. I have also made some amazing friends - which I have never met in person, but hope to one day. That sure hasn't diminished the friendship quality though!! I have also discovered the world of Youtube, and becoming a "Youtuber" - and the whole video making process. If you would have told me that I would currently have almost 1600 subscribers on my YT channel, I would have laughed! Me...on video...making cards??!! But here I am, and I have loved the whole process of growing with that as well. Of course, there are many of our favorite companies that are helping us celebrate, and here is just a few! !